Murphy's new firm, 360bespoke, targets the luxury space. Jeremy Murphy, the former vice president of communications of CBS and creator and editor of CBS Watch magazine, is opening his own boutique media agency called 360bespoke. The New York-based agency, which will officially open its doors on September 12, will offer public relations, communications, marketing, branding, media training and content development to select clients in the luxury space. This includes fashion, travel, lifestyle and the arts. Murphy, who spent 10 years at the helm of Watch magazine, said the firm would have a presence in Florida, Washington, D.C., Los Angeles, and eventually, London. 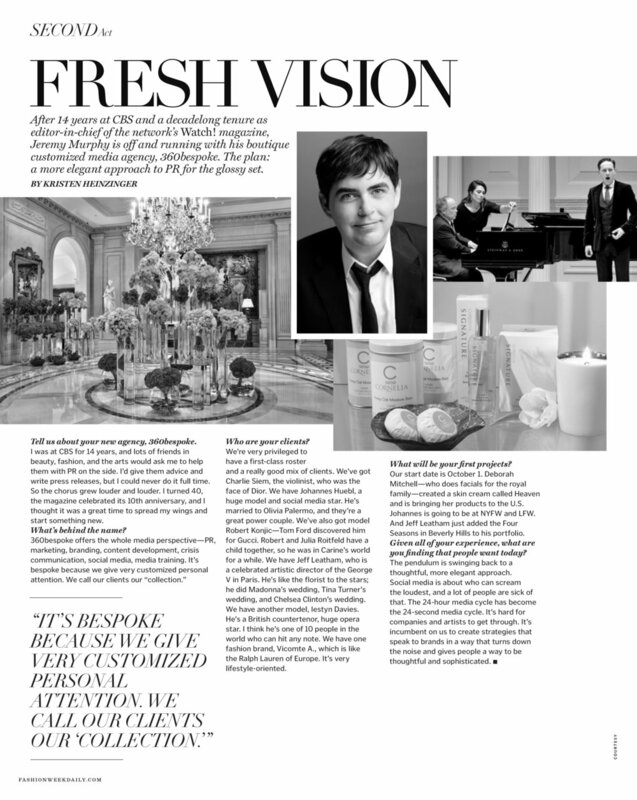 At launch, the firm has a roster of 14 clients, including European lifestyle brand Vicomte-A; violinist and Dior Homme ambassadorCharlie Siem; model Johannes Huebl; celebrity florist and artistic director of the George V Paris hotel Jeff Leatham; opera star Iestyn Davies; spa, skin and beauty brand Cornelia; model and British Fashion Council ambassador Robert Konjic; Deborah Mitchell, a London-based creator of Heaven skin care and beauty products; fashion and brand photographer Ian Derry; LA-based interior decorating firm Merrell-Williams Designs, and model Bertil Espegren, who owns Miami’s Bertil Bernhardt Design & Art Gallery. “The collection of clients we have is going to open a lot of doors to big brands in the luxury space who want to align with first-class talent,” Murphy told WWD. Well, at least ,that is the hope. Murphy, who spent 14 years at CBS, explained that 360bespoke would work to get clients in front of “mainstream press.” He cited Siem as an example of a client who has had success with fashion brands and magazines, alike.